Major international events of recent years have shocked many democracies into a discomforting recognition that the mere existence of autocracies abroad could have negative effects for their domestic policies. As of 2016, only 40 percent of the world’s total population lived in fully free countries, according to Freedom House, despite much money and efforts spent by world’s leading democracies and international organizations to promote democracy and the protection of human rights in their external policies. Under the rhetoric of democracy promotion, the United States (US), the European Union (EU) and other actors have increasingly used military interventions (e.g. Haiti, Iraq, Libya); imposed extensive economic or diplomatic sanctions (e.g. South Africa, South Korea, Iran); and spent billions in funding civil society initiatives in non-democracies (e.g. former Soviet Union countries). However, the democracy promotion policy towards different regimes has rather been inconsistent and heterogeneous, with some regimes receiving important amount of international opprobrium (i.e. North Korea, Iran), while others receiving far less reproach or condemnation (i.e. Middle East, Central Asian countries). Some attribute this disparity to the strategicness of some autocracies. For example, oil autocracies are a rather “distinctive, and often troublesome, force in the international system” and they differ from other non-democracies chiefly due to their energy importance for western democracies. Some argue that energy security interests propel democracies into turning a blind eye to the violation of human rights in oil autocracies. How reasonable are these claims? Given the importance of public opinion for foreign policy decision-making in democracies, I have tested this assumption with a research in public opinion. What shapes public attitudes towards autocracies? Are citizens less hostile to one type of autocracies than to others? Does public support for punitive measures against autocracies vary along the strategicness of the adversary? With an aim of shedding light on these questions I designed, fielded and analyzed original survey experiments in a representative sample of 1019 Spanish citizens. The experiment consisted of a short vignette describing a hypothetical situation. Individuals were asked to read a series of bullet points containing the detailed information about the situation. The first point explained that the Human Rights situation in the country X has deteriorated during recent years. It was then followed by a short sentence indicating the region of the country, Western Africa. The next bullet point was about the oil wealth. I randomly varied this information. The country was either an “oil and gas exporter” or “d[id] not export oil or gas”, which was the only manipulated factor between the first and second experimental groups. Participants were randomly assigned to one of the 3 experimental groups. Those who were in the third group, prior to reading the vignette, were exposed to a short paragraph: “The world remains energetically dependent on fossil fuels, such as oil and gas, raw materials that are in the hands of a few countries. The conflict with these countries may jeopardize the energy supply of a significant part of the population, or cause the increase of the overall price of energy”. With this manipulation I tested to see if the information about potential costs of punitive measures against an autocracy would deter the citizens from punishing it. Citizens were later asked to indicate their support for democracy promotion measures in the country. Findings reveal that while most citizens are in general willing to support democracy promotion abroad (approx. 89 percent), they seem to disfavour a military solution for it (78 percent against). 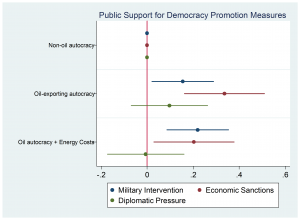 The fact that the country exports oil and gas has a significant and systematic effect on citizens’ decisions to strike or sanction a foreign autocracy (figure 1). Contrary to my expectations, however, citizens prefer attacking and sanctioning an oil autocracy more than a non-oil one, all else being equal. Further, I expected that when citizens are primed on potential energy costs of entering into a conflict with an oil exporter, they would be discouraged from punishing the country in question. My empirical findings show, nonetheless, that it is not the case. Irrespective of energy costs, participants in the experiment are still willing to punish an oil exporter more than a non-oil one. 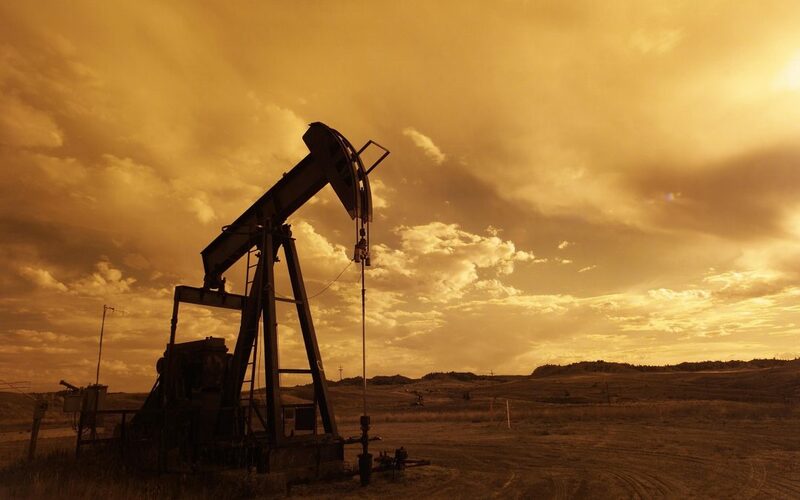 Some critics may contend that the oil is commonly associated with the Muslim Middle East, a sui generis region that holds almost half of the global proven crude reserves and it is difficult to disentangle these factors. However it is an unwarranted speculation in my case, since I tried to curtail this by explicitly indicating that the country X was hypothetical and located in Western Africa. How can the variation in public opinion be explained? One conjecture is that the mass may consider it especially necessary to promote democracy in oil-rich autocracies, given the potential strategic benefits of democratisation in these countries for western citizens. Another speculative explanation is that the public may consider these measures more effective in destabilising an oil regime, which is heavily reliant on foreign money for its survival in power. However as these are mere speculations, further research is needed to shed light on possible explanatory factors for the variance in public attitudes towards autocracies. The paragraph was adapted from the website of the Spanish Ministry of Foreign Affairs and Cooperation.